Recently as I was traveling to New York City from Charlotte, NC the inevitable thought of “being a big fish in a small pond vs. being a small fish in a big pond” entered my mind (as I’m sure it does with many people traveling to NYC). As I pondered this on the drive and flight, another thought came to me: it’s not about being a big or small fish in a big or small pond. It’s about being a REAL fish in a REAL pond. Feeling REAL today? I have also found that it’s not really about relative size (big to small or vice-versa) – but about REAL impact. Whether one’s sphere of influence is the size of a tennis ball or the size of the earth itself, it all comes down to one simple question: “Am I making an impact within my world?” Librarians, teachers, doctors, parents, friends – all can make an enormous impact daily. Whether that impact is felt in Charlotte or New York City is irrelevent. So, keep on keepin’ on, small fish! 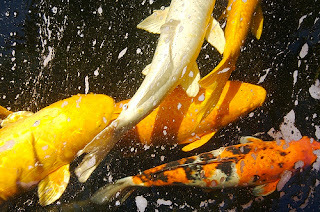 You can only be so real for so long when the pond you’re in isn’t real and is full of brown plastic fish.